galerie.de - "galerie le chiffre"
verliert sie sich in ihrem Medium und wird bedeutungslos. 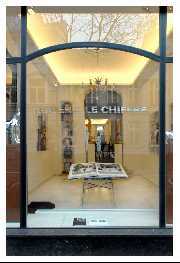 Philosophy of the Galerie le Chiffre Le Chiffre. This word embodies the uniting element between the artlover and the artwork. An artwork is never completely accessible at first sight, it requires time, patience and the natural passion for contemporary art to uncover all the layers it implies. As it is described in the theory of hermeneutics by Friedrich Schleiermacher, the observer tries to empathize with the creative thoughts of the artist in order to reveal and understand the content of the artwork. The process of decryption of the chiffre, which is part of every piece of art, will become a personal experience. That way the chiffre has the meaning of a connecting link and intense artexperience at the same time. But that not only the art of every artist is individual but also the relation between artwork and its unknown opponent is unique, is an important aspect we want to emphasize with every future exhibition. We do not want to influence the personal relation to art, thus we want to incourage the independent view in connection with thought-provoking impulses. A quote from Joseph Beuys says: „In the human being ideas move on, while in the artworks they freeze and will be left behind.“. For Beuys, a major german artist of the 20th century, the human being becomes necessary to enable the idea to survive: without us the idea fades and then becomes meaningsless. He elevates the recipient to a responsible carrier of the initial idea and also says that it will develope by the personal interaction with the artpiece.